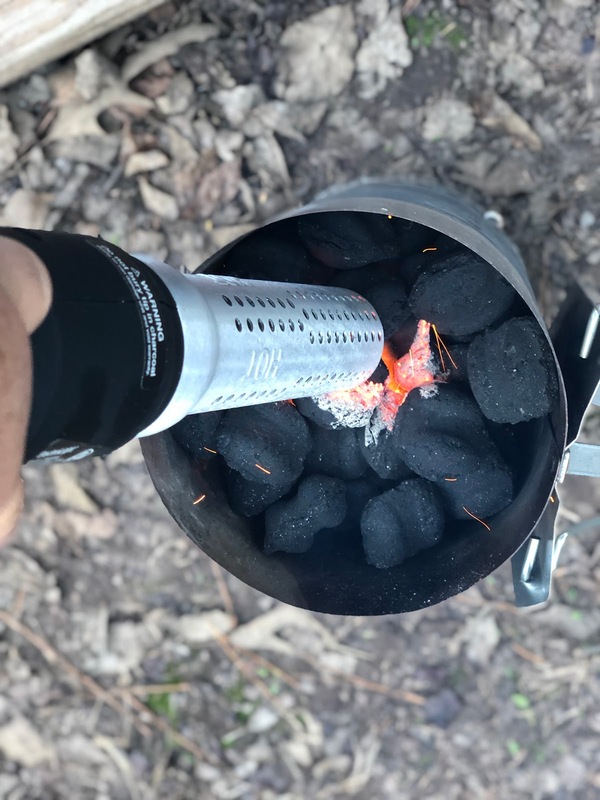 I never knew that I needed this tool until we bought a Kamado style cooker using lump charcoal. Lighter fluid really does affect the taste of your food. And, I hate to taint perfectly good grilled meats with chemicals that interfere with flavor. An electric fire starter solves this problem without lighter fluid. We have the HomeRight Electro Fire Starter. It looks like a really big curling iron to me. I'm a girl. I can't help that I'm making the comparison between grilling tools and hair wands. Point your electric fire starter at the charcoal that has been stacked in the chimney starter. Stack your coals into a chimney starter. Depending on your preference, you can purchase lump charcoal or briquettes. However, you will not need instant light products or lighter fluid. I am not married to a particular brand. 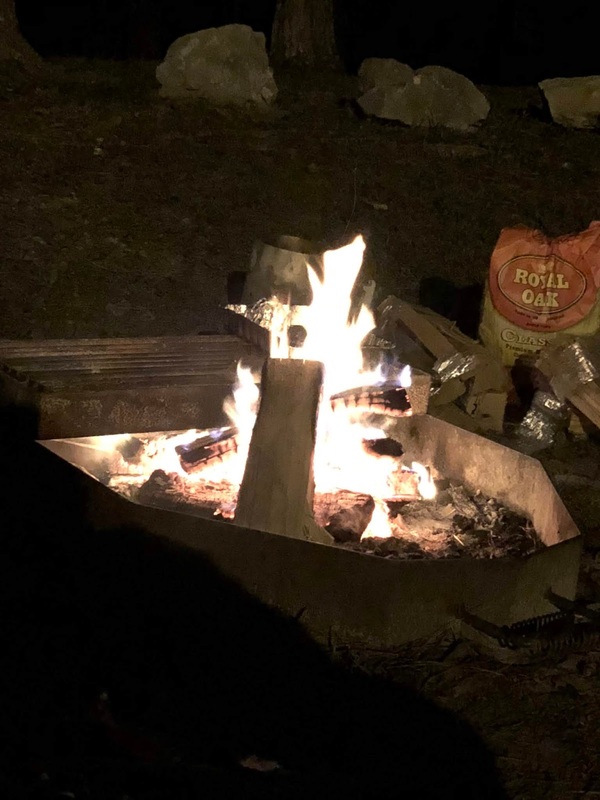 I like Royal Oak briquettes and I have a big bag Cowboy Charcoal at home for lump charcoal. I find that briquettes work better for dutch oven cooking. 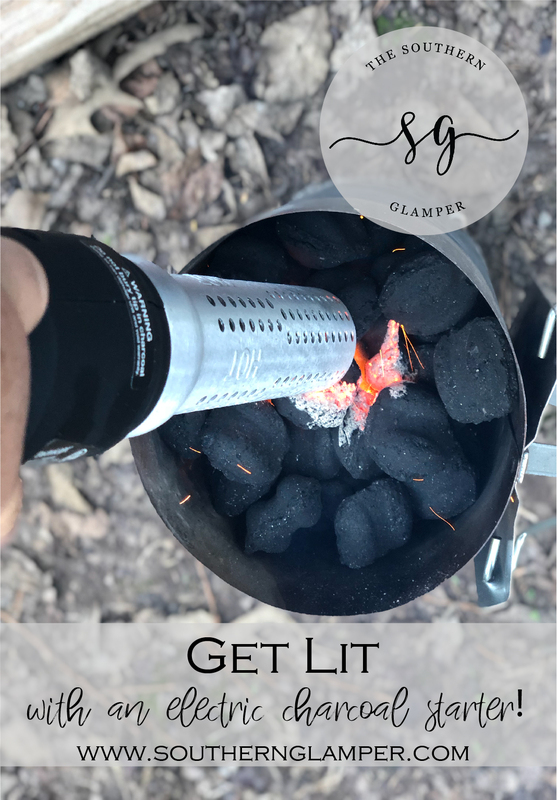 I like lump charcoal for my cooker at home and grilling. Once your charcoal is in the chimney starter, plug in the fire starter. Point it into the charcoal and press the red button to turn it on. This will intiate both the heat and blower to get your coals sparking. Do not bury the starter into the coals. Just point it down and into the coals and hold it on unto you see the coals start to spark and heat. The coals will start rather quickly. The fire will light quickly. You can then let your charcoal burn on its own. After you get your coals going, you can let them continue to burn until they are ready to use. I recommend doing this over your grill grate or grilling area. You can also do this on the pavement. Mainly, don't do this where you might catch something on fire with the sparks. When your coals have begun to ash, I recommend using some Pit Paws to dump out your coals. This protects your hands and withstands heat much higher than traditional oven mitts. I use the Pit Paws to keep my hands safe while dumping the coals from the chimney starter into the grill. My husband thinks this process is rather magical. 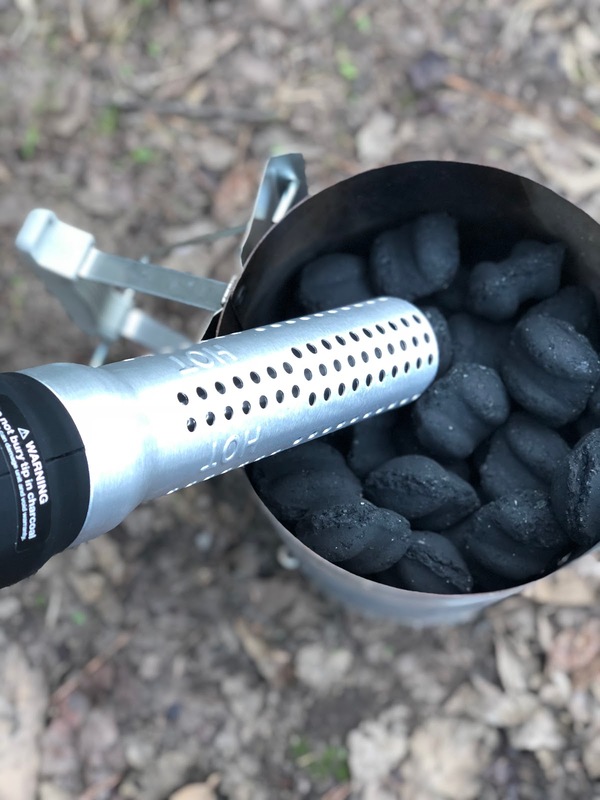 It really is the quickest and easiest way to light your coals. And, it is far less frustrating that my failed attempts at crumpling newspaper and other lighter methods. You can also use your fire starter to light your campfire. Set up your wood and kindling. Plug and point your starter at the kindling to light your fire. The blower provides the oxygen needed to really get your fire going at a rapid pace. Even though this is a great gift for dad or that man in your life, its a gift really for anyone that likes to grill or enjoy a fire. Women participate in these activities too. It has been a real problem solver for us. I hate to be all about the gear, but it does make these tasks effortless. It takes up little room in my camper storage. Once you pick up one fire starter, you will want to invest in a second one to keep at home.